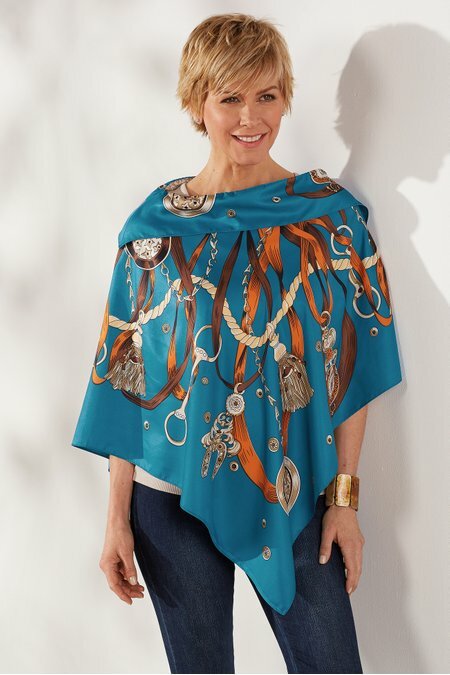 For an instantly polished look, this light, flowy poncho-style topper hits all the right style notes. An elegant print of lavish ribbons, tassels and historic medallions adds a luxe, upscale vibe, while the butter-soft fabric brings in flowing movement and a light, feminine drape. Turn down the top edge to create the appearance of a lush folded collar, and prepare to feel amazing. Poly. 32-1/2" long at center back.